Large oceanfront home with two private swimming pools. 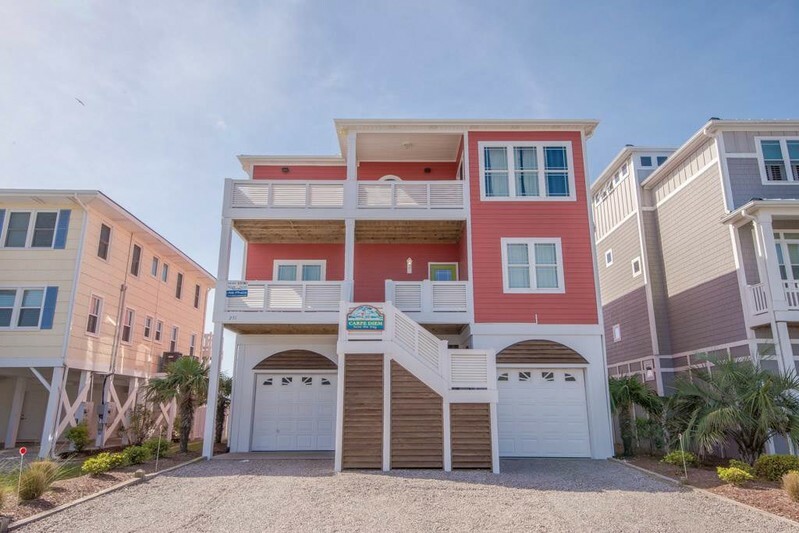 Sleeps 18 in 6 bedrooms and 5.5 baths. One pool overlooks the beautiful Atlantic with an expansive deck and gazebo to enjoy the sweeping views and ocean breeze. Also, enjoy an additional in-ground pool. Plenty of games to play in the fenced yard. Updated and expanded living room, large dining room, well-equipped kitchen, second living room area with television, and bar for additional eating space. Other amentities include an elevator and handicap ramp, personal safe, 2 washers and dryers, blender, toaster, ice maker, charcoal and gas grill, high chair, portable crib, 1st floor beverage center (minifridge and coffee maker), wireless internet access, picnic tables, pool chairs, large flat panel televisions, DVD player, expanded cable service with HBO, outdoor loungers and rocking chairs. 2 laundry rooms. Louvered protected parking and overhead doors for safety. Bedding configuration include Downstairs: King, 2 Queens and bunk bed set, 2 sets of bunk beds, queen, queen. Upstairs: King. Televisions in each bedroom. All linens and towels are furnished as part of the rental rate. Non-smoking, no pets allowed.